As many of you know, Annapolis is home to the United States Naval Academy. Since Handmade by Allison is based out of Annapolis, we have a lot of brides who get married at the Naval Academy Chapel. Today we wrapped up an order for Regina and Joseph who are getting married there in a few short months. 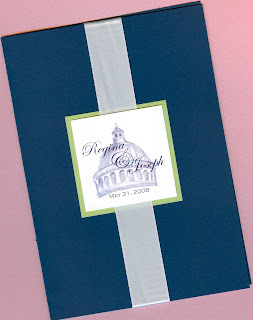 Regina’s invitation is a folder style invite in navy blue, with celery and white accents. 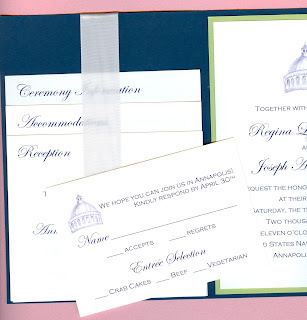 The monogram tag on the front, invite panel and response card incorporate my hand sketch of the dome of the chapel. Hope you enjoy the pictures of Regina’s invitation! Welcome to Handmade by Allison’s Blog! Well, I’ve done it now! After watching many fellow wedding vendors blog their days away, I’ve decided to enter the world of posting. I hope it will be a place where my current clients can see their designs come to life and give potential brides the opportunity to learn a little more about Handmade by Allison. I hope you enjoy the posts, pictures and more! So, in my first post, I wanted to share a picture of Kim’s invitation, which we just finished today! These unique pocketfold invitations include a pool colored square pocket, lime accents, natural raffia and gerber daisy accent. 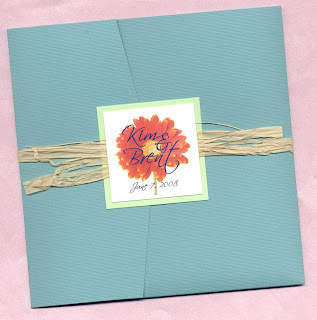 We love this invitation and can’t wait to see what Kim thinks on Saturday when she picks them up from our studio! !